Sold and Shipped by Foxy Luxury Inc.
World renowned wholesaler of luxury goods goes online. Visit our online store to find the best selection of designer sunglasses and handbags from world renowned fashion houses. Stay foxy! For customer service inquiries or to initiate a return, please contact Foxy Luxury Inc. at team@foxyluxury.com or (877) 369-9589. You can initiate a return for new and unopened items within 15 days of delivery for a refund. To qualify for a refund, items must be in new and unused condition with all original materials and/or accessories. If a return is not received at our processing facility within 30 days, it may be subject to a partial refund. You will be responsible for return shipping costs. However, if the return is a result of a fulfillment error, product defect, or damage incurred during shipping, we will refund the full cost of the merchandise. We will provide a pre-paid return shipping label for Non-Buyer's Remorse returns. All returns are subject to inspection, and if found not to be an error on our part, the return shipping costs will be withheld from your refund. SPECIAL RETURNS INSTRUCTIONS: Once the seller approves the returns request, they will provide a Returns Merchandise Authorization. The Seller cannot accept returns for used items. The Seller charges a restocking fee of 20% that will be withheld from the refund. These Ray-Ban RB3016 W0366E sunglasses proudly showcase the brands clubmaster shaped full rim gold toned metal frame accompanied with lightweight tortoise brown acetate along the top browline. Distinctive features include a banded detail gold metal single bridge a sturdy four barrel hinge adjustable nose pieces and decor consisting of Ray-Ban signature metal accents on the temples and tortoise acetate arms. 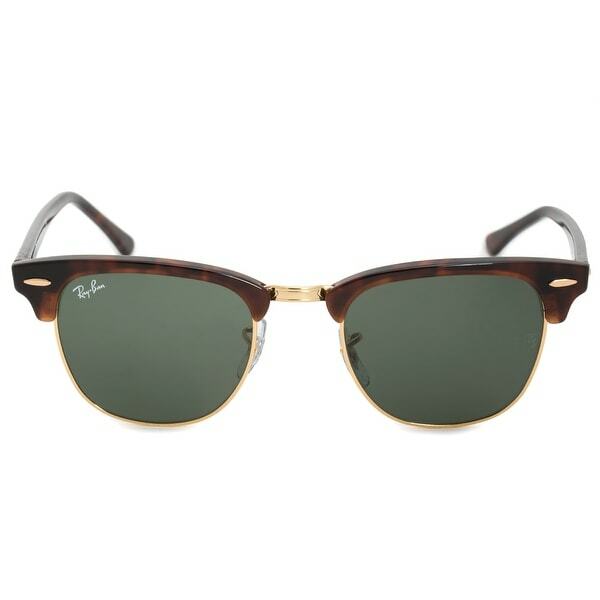 Green classic G-15 lenses provide 100% UV protection. These luxury sunglasses measure 49-21-140 mm and ship with the branded Ray-Ban case lens cleaning cloth and designer's documents. Made in Italy.